Another Monday and another ski trip adventure. 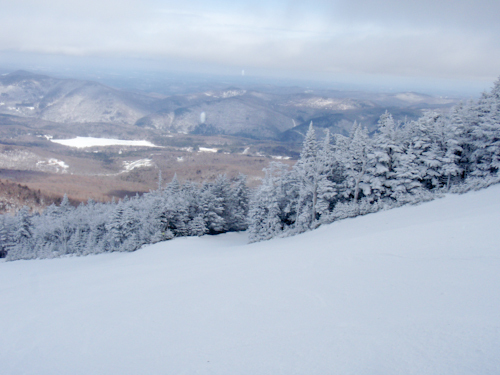 This week I went to Pico Mountain Ski Area in Killington, VT. I had never been there and had always wanted to go. 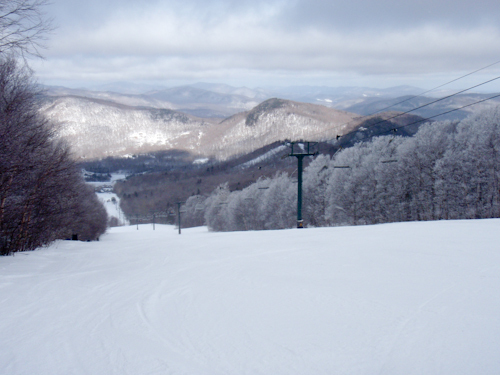 Like many people I had always gone to the larger and more glamorous (and higher priced) Killington Ski Area next door. 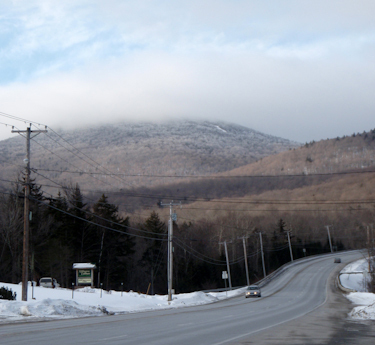 As I pass the Killington Access Road I noticed that the peak of Pico is hidden in a cloud. Exploring a new mountain is always fun. I had both my camera and video camera with me. There was a light snow in the air as I got on the lift. 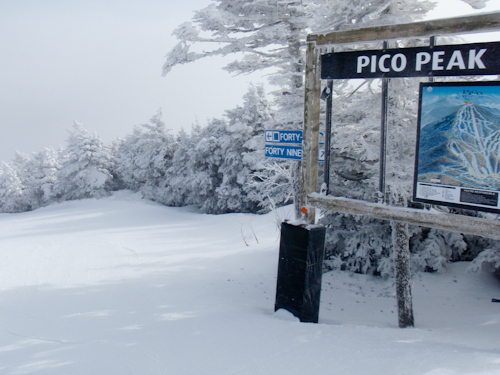 At Pico you need to take the Golden Express Quad first and ski down to the Summit Express Quad to reach the top. 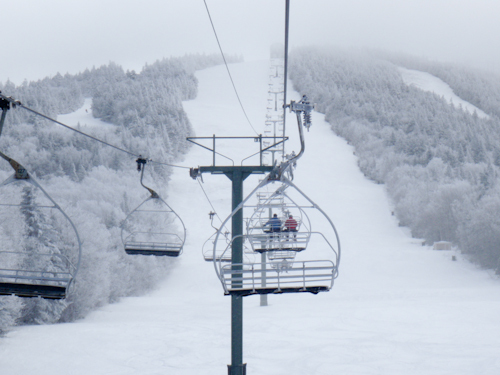 It was kind of strange riding the chairlift up into the cloud covering the summit. No view from the top today. 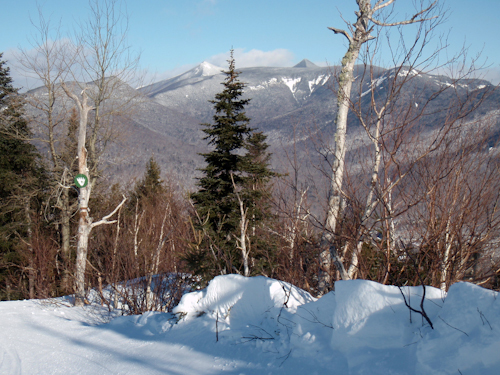 The top of the Forty-Niner trail is interesting because the trail winds between small islands of snow covered trees. Using Google Earth helped me to learn a bit more about the view I see at all these ski area. 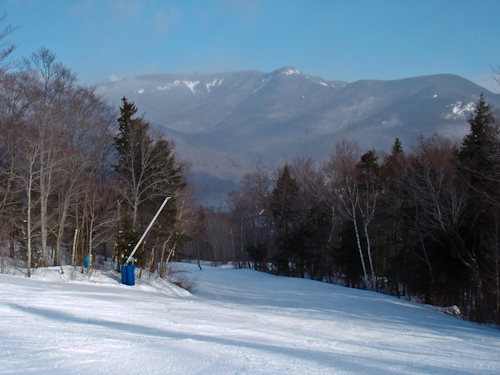 The mountain in the foreground is Deer Leap Mountain. The body of water visible down the valley on the left is the Chittenden Reservoir. This is the view north looking at Deer Leap Rock and beyond towards Doubleday Mountain. The summit stayed in the cloud most of the day with an occasional flurry coming through. This is the view from high up on the Forty-Niner trail. In the distance is Kent Pond off of Route 100. Behind that is Doubleday Mountain to the left and Shaw Hill to the right. It was a fantastic day! 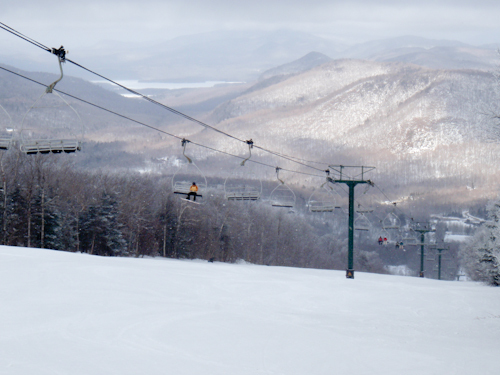 I really like the nice wide trails and excellent grooming at Pico. The crowds were sparse and I often had the trail all to myself. I will be sure to return to Pico in the future! 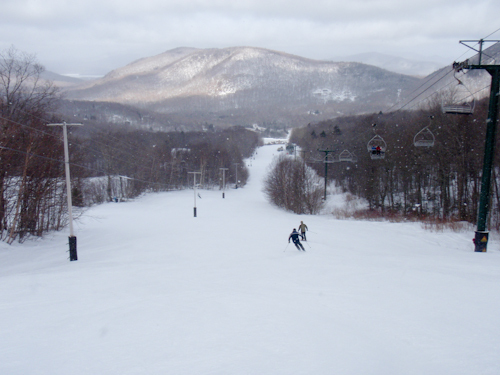 Ski Trip to Loon Mt. 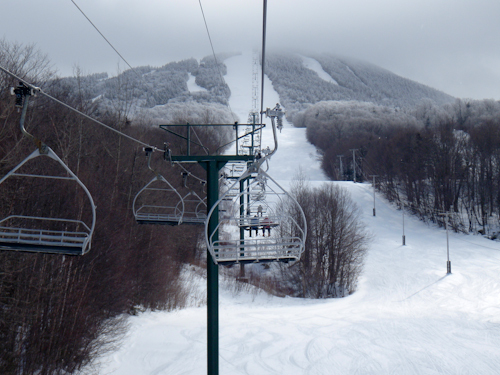 I took a Monday off from work and made my first trip to Loon Mountain Ski Area in Lincoln, NH. This is a trip I had wanted to make for years. It was a clear and cold morning. They were making snow like crazy to recover from the rain of the previous week. 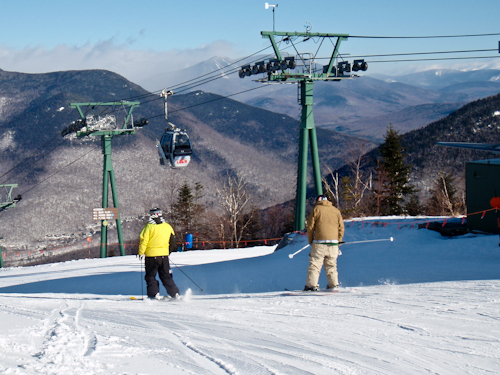 Their efforts paid off since the snow conditions at Loon were better that day than many other New Hampshire and Vermont ski areas. I enjoyed a fantastic view of the south face of Whaleback Mt from the Rampasture trail. Rampasture turned out to be my favorite trail of the trip. I enjoyed more runs on this trail than any other on the mountain. 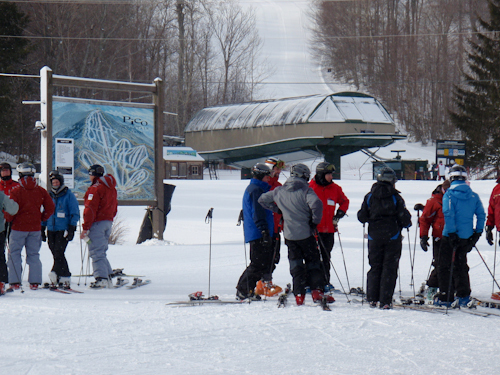 After many runs from the Kangcamagus Express Quad I finally made it over to the Gondola lift and went to the summit. 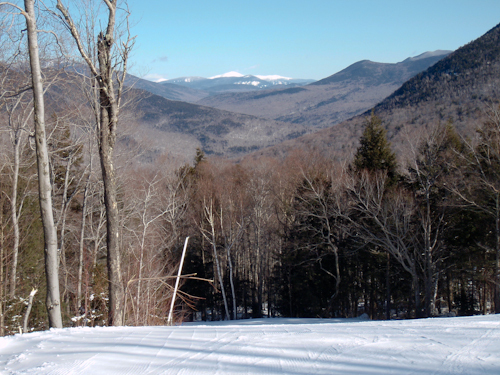 I enjoyed a great vew north towards the Pemigewasset Wilderness region. This is one photo of the view looking north from the first corner of the Exodus trail. The panorama view from this vantage point is spectacular. This is the view northeast looking towards a snow covered Mt. Washington off in the distance. 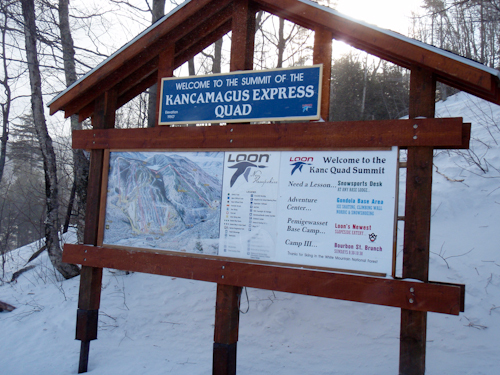 I am very impressed with the trails, the view and the grooming at Loon mountain and plan on going back, maybe even for an overnight trip. In addition to photographs I took several minutes of video footage which I hope to make into a YouTube movie . Visit my page at Flickr.com for the full photo set and my channel on YouTube for the video.